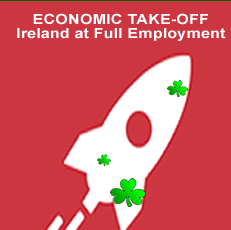 Ireland's economy is heading toward full employment. If you consider that this country had an unemployment rate of well over 15 percent only a few years back, this startling news shows the magnitude of the economic turnaround. It also demonstrates the resilience of the Irish people, the effectiveness of agencies promoting Ireland as a great place for international companies to set up shop, and the success Irish exporters have had in gaining market share internationally. And if you're a 'foreigner' hoping to work here, you could be in luck. A strong jobs market should spark opportunity for would-be immigrants. Increased demand for employees by a slew of companies and organisations across the country may not be met by available supply. The local workforce may need to be supplemented by 'foreign' talent to take up the slack. Winners in the race to work in Ireland will, of course, continue to be made up mostly of other EU nationals who have existing employment rights to work in all EU member states (including the Irish Republic). However, the high demand for talent across many skills should also drive up employers' willingness to hire non-EU nationals to fill positions. As mentioned elsewhere in this blog, employers must apply, and pay, for work permits when hiring employees from non-EU states. Which means, of course, that if you're a foreign national who is chomping at the bit to move to, and work in, Ireland - now is the time to start planning and reaching out. If you, as a would-be immigrant to Ireland, possess skills that are deemed 'critical' to the Irish economy, you have an outstanding chance to gain a work permit (see Irish Highly Skilled Occupation List for more information). Truly thinking of moving to Ireland? First, find out if you're eligible for a work visa. Click here to see Visa rules. Next, take a hard look at the true cost of living in this fabulous country. And yes...depending on where you live it can be very expensive. Next, take a look at the jobs market (see the links on the Right Hand side of this blog, or simply Google Ireland and see what happens). Then start reaching out.... by email and phone. Come over for a visit. Keep your eyes open for Jobs Fairs. Shake hands. MEET PEOPLE. The Irish are a personable bunch of folk, and the best way of getting a job is to put in a little face-time. Then - keep on networking. Use LinkedIn, for instance. Keep it up and who knows? You could be surviving here just like I have. The demand for skilled employees over here is strong. The economy is growing. Ireland is full of opportunity.